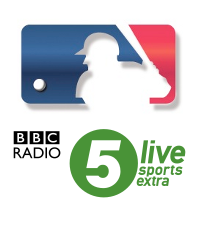 BBC Radio 5 Live Sports Extra is scheduled to broadcast a live MLB game for the first time next Sunday evening. Baseball fans across Britain will be sitting excitedly at their DAB radio or computer to listen to a top match-up from the American League as the Rays take on the Twins at Target Field from 19.00. British-based baseball fans have longed for some good news telling us that our beloved sport would be available more widely once again ever since Five’s decision to discontinue their North American sports coverage at the end of 2008, ending a 13 year relationship with MLB. While established baseball fans can take advantage of subscriptions to ESPN America (now in HD on Sky) and/or the great offerings at MLB.com, MLB’s disappearance from terrestrial TV has been a big blow in the campaign to attract newcomers to the sport. This isn’t quite a return to TV coverage, but it’s the next best thing. Baseball suits the radio medium perfectly, in the same way that the BBC’s Test Match Special is the preferred way to follow England’s cricketing exploits for many people. We don’t yet have details about whether this a one-off deal or a longer term arrangement, or quite what the programme format will be. The NFL coverage on 5 Live Sports Extra normally takes a local radio feed for the game (occasionally they provide their own commentary), with a UK-based studio providing analysis and news during breaks in the play. Arlo White, Neil Reynolds, Greg Brady and the rest of the ‘NFL on BBC’ crew take a similar approach to that of ‘Baseball on 5’: insightful analysis for both newcomers and established fans, with plenty of humour and audience interaction thrown in for good measure. Hopefully the MLB coverage will take a similar format and it will be a regular programme. ‘Baseball on 5’ didn’t just provide us with MLB games, it was the focal point for the British baseball community. It’s not quite the same without the likes of Jonny Gould and Josh Chetwynd bringing us all together and if the BBC coverage can take on that role, it will be great news for us all. Commentary on Tampa Bay Rays against Minnesota Twins on American independence day. Who would have thought that a quick glimpse at the BBC Radio 5 Live Sports Extra schedule could bring so much joy? UPDATE: As noted by Chris in the comments, it’s been confirmed that Jonny and Josh will indeed be hosting the show. Roll on Sunday evening! We are provisionally planning to run a live blog during next Sunday’s game. More details will follow nearer the event. Good news on the Jonny and Josh front. The dynamic duo will be presenting coverage of the live game on Sunday 11th May, which will be Chicago White Sox v Kansas City Royals. Certainly is fantastic news. Great to have them back. ‘Good evening fellow baseball nuts’ will ring out once again. according to his twitter Nat Coombs is joining the show from 1st August so defo an on-going thing at the moment. The NFL coverage is to continue for the next season, which has got to be cause it was succesful so if we get behind the MLB coverage we might get some commitment to it from the BBC. Thanks for the info Mike. I enjoyed Nat’s presenting stint on Five’s NFL coverage, so he’d be a very good addition to the team. Isn’t it great to have some positive news about baseball coverage in the UK for a change?! Lots of info now available on Facebook. Join up to the MLB on Five Live group page for all the latest news. We’ll definitely be running a live blog here on Sunday evening, so stick the radio/online stream on and come and join in! this is fantastic news , thanks for posting about this Matt. Havent been about much as Im in the process of moving house and look forward to listening to the game on the BBC this Sunday whilst packing boxes ! Hi Richard. Technically it’s the other way around for those first few games: BBC want the programme to start at 7pm for those weeks for other scheduling reasons, therefore Central (midwest) games are being broadcast to fit in. The show will move to 6pm in September so I’m sure your hopes for AL East games will be met then! The MLB show is being made by the same production company as the NFL show, so when it comes to September it will be a case of MLB from 6pm, with NFL following at 9pm (or when the baseball game finishes). Sounds good. I thought only ESPN Radio had the national US radio rights to MLB otherwise its the teams radio announcers? The BBC will be using the commentary by one of the two teams’ local radio feeds, normally the home team. It will be the Twins Radio Network this Sunday (John Gordon and Dan Gladden). Stumbled upon the JG & JC broadcast last night. And all I can say is WOWW!!!! I thought I’d lost baseball forever after Five pulled out, but now they’re back. God I missed you guys!! Thank you, thank you, thank you BBC. Is great news and the show went really well. Delighted to have them back, even if only on the radio.